Every once in a while, we receive a posting in our Guestbook which really cracks us up. This one evokes memories of the Louisiana Purchase, a subject which most American pupils are taught in history class  but with a new twist. We also find it inspirational when someone manages to muster a sense of humor amidst the destruction and despair of a natural disaster. May others gather strength from this survivor's approach to life! Dear France, please buy us! Greetings from Louisiana! We are shopping for new owners, and we immediately thought of you! Our present rulers haven't been taking very good care of us, and we are looking for a better deal. They are spending all our money in a place called Iraq (somewhere in the Middle East). We thought that perhaps you might want to revisit an old land deal you made long ago. If you've been reading the papers lately, you may have noticed that we have had a few problems with "water". No, we're not offering you a deal on a damaged water park. (Although that's what it looks like from the air.) Seriously, we need help, and fast! Historic land marker at Jackson Square in the French Quarter. We named the state after your King Louis. We named the city after your city, Orléans. We have lots of French names on the streets. We like French food and wine. Some of the most beautiful houses in the world (very, very wet). If you insist, we wouldn't mind some more outdoor cafés like you folks are famous for. Please think this over carefully. Our current owners are so busy in other countries, they might not even notice if you come down here and take a look around. We'll put you up in grand style in a place we call "The French Quarter" (yeah, really!) and you can have lunch at a place we built for your very own Napoleon, which we call (you guessed it!) "Napoleon's". You'll be right at home. Oh, just remember, we would like the levees and the wetlands taken care of ASAP, sometime just after lunch if not sooner. 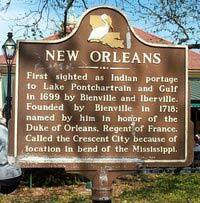 Images: Historic land marker for New Orleans, from Wikipedia, the Free Encyclopedia.